The current version of this page has moved. Continuing work on FairPay is being pursued as a pro-bono project. The information below is no longer current. Please use the links above. 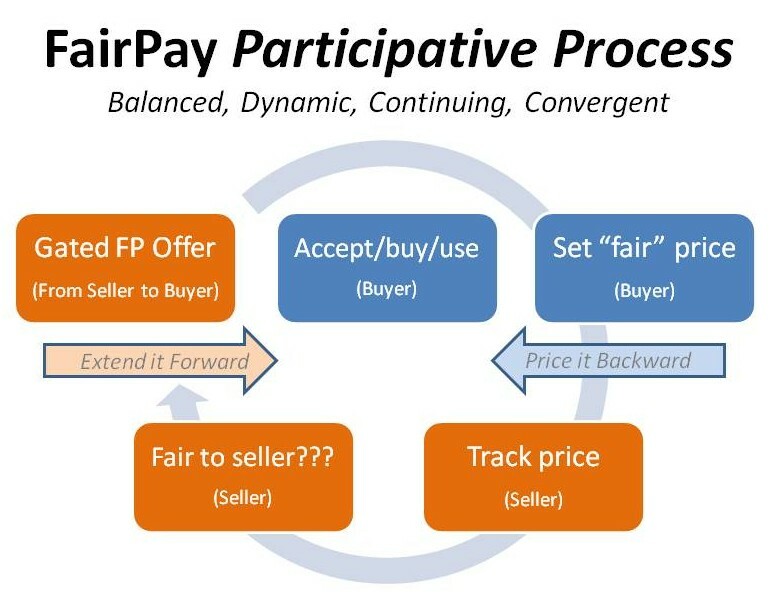 The following is a rough model of how a FairPay offer might be framed to a buyer. For this simplified example we consider a newspaper that has decided to go to a freemium "soft" pay wall model such as planned by The New York Times, and by others considering the Journalism Online Press+ platform. Call it The Times Journal. A sample FAQ is also included. As you know, The Times Journal Web site has been free, but we cannot continue to offer it without some subscriber payment and still provide the quality content you count on. Providing the journalism you expect from us is very costly, and more and more readers now get it online. We are offering a conventional subscription plan, but also are experimenting with a new way to give our readers an unusual degree of freedom, largely on a "pay what you think fair" basis, as an alternative to more rigid conventional pricing methods. As with many Web services, we now offer a simple pricing plan with two levels of service: a basic level of up to 10 articles per month free, with a subscription level that is required for more intensive reading (more than 10 articles per month). The standard subscription costs $4.95 per month. You may elect that subscription plan now, or at any time that you decide you want more than 10 articles in any month. As a preferred, more flexible alternative, we are selectively offering to you and other regular readers what we call our FairPay Plan. This monthly service works on the basis that you "pay what you think fair" -- you are free to set the price each month to whatever level you believe to be fair, considering your level of use and the value of The Times Journal to you, at the end of each month. The FairPay aspect of this plan comes in from the fact that we will review what you elect to pay each month (and your usage for that month, plus any feedback you provide in your pricing form), and will determine if you have been paying at a level that we can accept as fair. If so, we will continue to offer monthly renewals to you on this FairPay basis. If not, you will be offered a regular subscription at $4.95 per month, or can simply revert to just the 10 articles per month that are offered free, with no subscription. If you try our FairPay Plan and continue it at satisfactory pricing levels for three months, we will provide a special bonus, a Times Journal "FairPay Patron" tote bag, in fine canvas. This $15 value item is available only to FairPay subscribers in good standing. As you continue on the FairPay plan, we will provide other special bonuses from time to time, as a reward for your cooperation and continuing readership and support. We view FairPay as a way for us to jointly learn how to exchange the value you get from us for the money you agree to pay us for our newspaper. Over time we hope to add more nuanced offers, so that we learn to understand our subscribers better. Those who pay well will get premium service levels and various special benefits, and those who pay less well get more basic service levels. Of course those who pay much less, at a level we cannot accept as fair, will be offered only the standard subscription plan. Also, after a few months we plan to allow readers who pay at acceptable levels to set prices less often, going from monthly to quarterly, and later to yearly pricing reviews (unless you prefer more frequent reviews), so that the process becomes even easier. Additional information is in the FairPay FAQ below. Why are you offering this FairPay Plan? We want to give you the maximum flexibility to set a price that is fair with respect to how you use The Times Journal, and how you value our journalism. We are counting on your fairness, and we want to build a cooperative relationship with you, as one of our valued readers. If you play fairly with us, we will do our best to give you maximum freedom, and to find other ways to reward you. The FairPay Plan is intended to let you tailor a plan that fits you exactly -- and to continue to make adjustments as your usage warrants. You may feel you will not read enough articles often enough to make the standard subscription fee of $4.95 worthwhile. Maybe you will only read a few more than the 10 free articles. We know that standard subscription plans have many disadvantages. Obviously, we have to set our regular subscription price at a level that covers the usage of our average subscriber. We have to balance a price that will not discourage occasional readers, but will also not be so low that regular readers do not carry their weight. One single subscription price does not really fit all. What if I view only a few articles in one month? If you view less than the 10 articles that would otherwise be free, or even a few more, you are free to pay nothing, without fear that we will revoke your FairPay privileges. However, as a regular reader you might also feel that those articles were valuable, and that some payment is appropriate. What if I am a heavy reader of many articles almost every day? We hope you find greater value than the average subscriber and will feel it appropriate to pay proportionately more than the $4.95 rate (which is aimed at average subscribers). If you do so, we may offer special services to show our appreciation. But a payment that is not well below the standard rate would not lead us to revoke your basic FairPay participation. What information will you use to decide what is fair? We will provide a usage report with a simple Web form that you can use to indicate why you paid what you did. You might use this to clarify your usage of services, your view of the value received, the context of your use (such as business or pleasure or student), and to note any service problems you encountered, and the like. 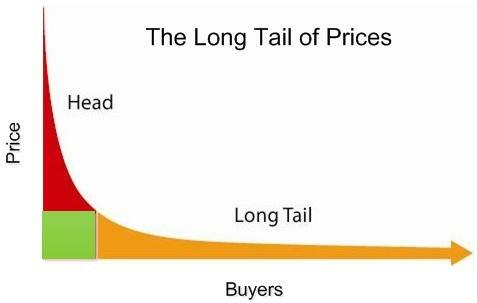 If your pricing is above or below average, this will help us understand why you think that to be fair. We will also ask if you are willing to share some basic data on your demographics and income (but will not require that). We may also check commercially available databases to better understand your situation relative to our other readers. What if I am on a limited budget? We understand that people have varying means, and are willing to adapt our expectations accordingly, based on what you tell us and what we may know from other sources. What if few readers pay as much as you would like? Our hope is that readers will understand that we need to cover the costs of our journalism. If too few readers do, we may be forced to eliminate the FairPay option, and require all readers to subscribe at fixed rates if they want to read more than 10 articles per month. Much as public television and museums have premium subscribers and benefactors, we hope those who are regular readers -- and those value the quality of our content, and can afford to pay more, will see fit to do so. We hope you will see that as a way of helping us to serve you -- as well as to compensate for those who cannot afford to pay full price. We will seek ways to show our appreciation to those who pay at premium or benefactor levels. Can my payments vary widely from month to month? Sure, if your usage varies, or your value-received varies, it would be fair to reflect that in what you decide to pay. For periods you use a lot, and get high value, a higher price might be fair. If there are periods you are away or otherwise not reading often, a lower price might not be inappropriate. And if we help you achieve financial success, perhaps you will see fit to thank us with a higher price. To the extent that we see that your usage varies, we will report that and suggest a price that we think corresponds accordingly, but you will still be free to adjust upward or downward from that as you judge fair. The pricing form will ask you to set your price in terms of a percentage of the suggested price -- you can price at that suggested price, or higher or lower by whatever percentage you wish to specify each time. Can I pay nothing at all? Yes, any time you really think that is fair. If you give a reason why you think that is fair, and it is a reason we can accept as reasonable (such as being away, or having reported technical problems, or some other reason why you feel that you got little or no value), we will try to be accepting of that. But if there you do not provide a reasonable explanation, we will not continue your FairPay plan. Might I get cut off from FairPay if I make a single mis-step that you consider unfair? Not if you make a reasonable effort justify the fairness of any payments that are well below suggested prices. FairPay is designed to converge on fairness over the course of a relationship, so if you show a good-faith effort to explain low payments on your pricing form, we will seek to understand your reasons, and work with you. We may ask for more information, and/or may put you into a probationary status while we try to continue to work with you, to see if we can agree that you are being fair over a series of transactions. But if you set a very low price without giving any justification, then you might be excluded from further transactions. Even then, we will offer a dispute resolution process if you wish to seek re-instatement. Isn't this monthly price setting going to be a burden? We will do all we can to streamline the process. Once we see that you are pricing at acceptable levels, we will extend more FairPay "credit," allowing pricing to be done quarterly, or even yearly. We expect to start that after three months. Your monthly pricing form will have simple buttons to let you select the standard subscription price of $4.95, or a suggested price based on your actual usage, or the price you had set for the previous month, or to let you enter any other rate you wish. The form will also have a simple multiple choice form for feedback on any issues that affect why you set that rate (and a space for entering any comments, if needed). We hope you will find that it provides you with a high level of flexibility and satisfaction, and helps us serve you better, and that compensates for any minor effort it adds. Analyst on FairPay: "intriguingly powerful"
Seeing the full power of FairPay, and how it works, takes a step outside conventional thinking. Teleshuttle is working on a pro-bono basis with industry and academic partners on research, trials, and applications of FairPay. if they do not have to? ...A blog post explains this: The green area shows the revenue under standard pricing -- The red and amber areas show potential revenue that is lost under standard pricing, but can be realized with FairPay. 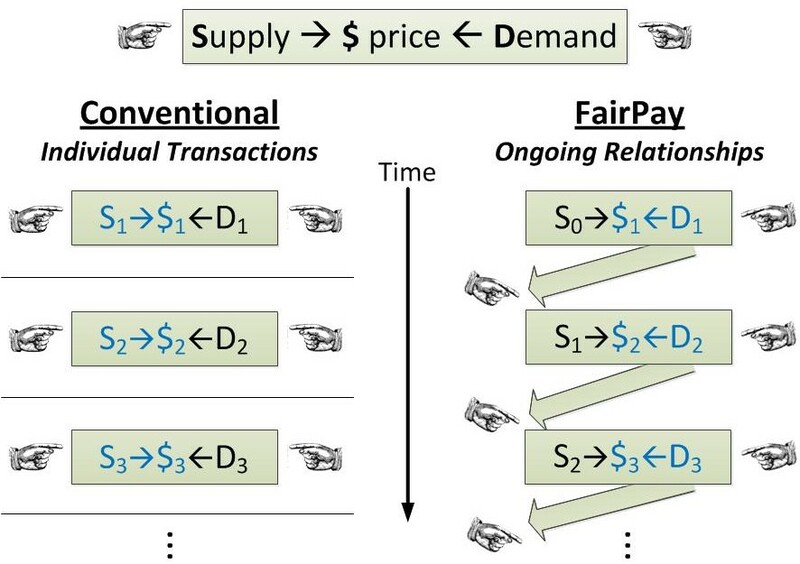 ...A blog post explains this: FaiPay turns the invisible hand on its side -- to optimize the balance of supply and demand in terms of prices over time, with respect to individual customers. Paywall 2.0 ...and Paywall 3.0 -- Focus on the Customer! Price Discrimination Can Be Good! 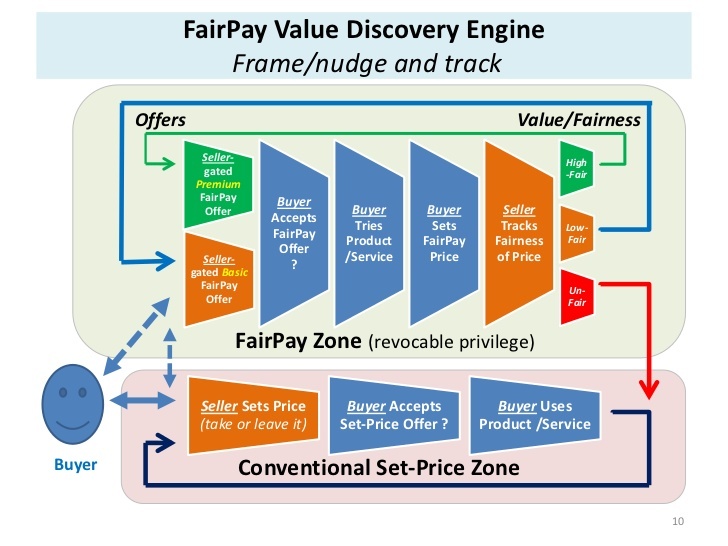 Consultant John Blossom: "Pay as You Exit: FairPay Explores New Content Pricing Discovery Regimes"
Pay What You Want -- Still Crazy After All These Years? 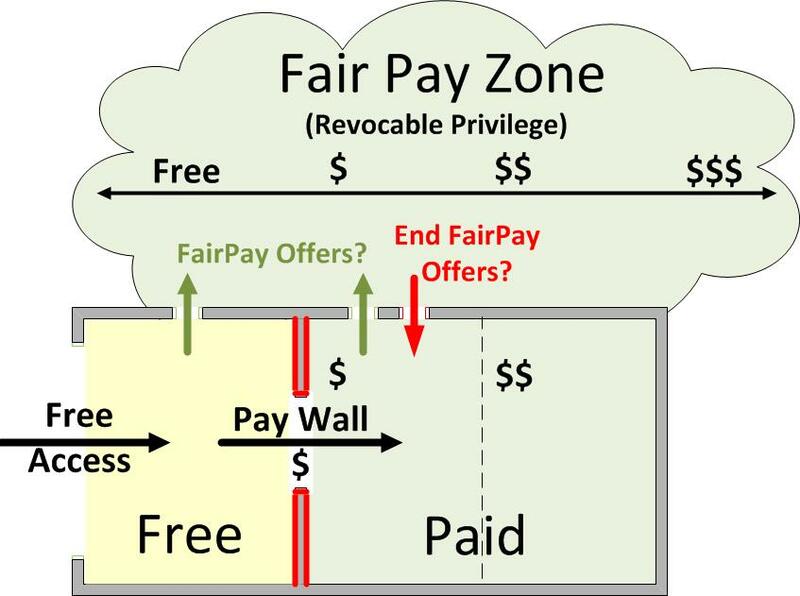 FairPay -- Why Would Anyone Pay If They Don't Have To? to potential partners and researchers.. Copyright 2013, Teleshuttle Corp. All rights reserved. Patent pending.